Last week when we wrote about setting a Nautilus keyboard shortcut for opening a terminal in the current folder I said I wanted a terminal embedded into Nautilus, just like Dolphin has. Well, good news: FLOZz created just that: a Nautilus extension (called Nautilus Terminal) which embeds the terminal into the Nautilus window. 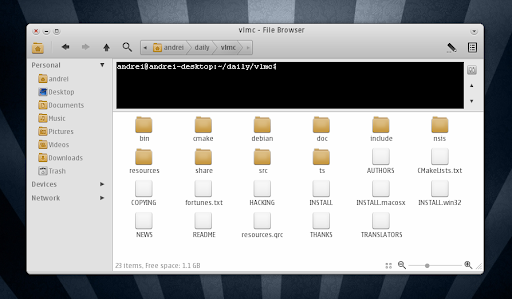 And just like it is with Dolphin, when you navigate to a different folder, the terminal also "cd"s into that folder. There is one catch though: currently there is no way to disable the embedded terminal (like a keyboard shortcut to toggle the terminal on/off) so if you install this, you'll always have a terminal embedded into Nautilus. But you can however set it to only show up for certain folders you set. Nautilus Terminal is customizable too: you can set up its height (click the up/down arrows on the right), the colors, font and cursor shape. But Nautilus Terminal has only been released yesterday (version 0.1) so it might get this feature in the future. Nautilus Terminal already has a PPA for Ubuntu 9.10 Karmic Koala, 10.04 Lucid Lynx and 10.10 Maverick Meerkat. Update: Nautilus Terminal got keyboard shortcuts for toggling the terminal on/off. Many thanks to FLOZz for the tip and amazing app!